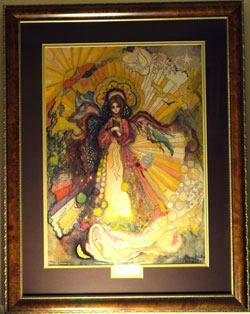 A limited edition artwork by singer and songwriter Stevie Nicks, titled Rhiannon, is up for auction at CharityBuzz.com. According to Charity Buzz, the item is a limited edition print of an original, and it is one of 5000 that were printed. However, they say that there are only 100 that have ever been offered to the public that are this poster size. The auction is in support of Bette Midler's New York Restoration Project. Bidding for this item ends Nov 8, 2007. Visit the Pop Life Art celebrity artists list for links to the artwork of more than 100 singers, actors, and musicians.